Suitable for room decoration, shop window, KTV or to take as a background light for light box or for computer screen. You can cut it by every groups of 9 LEDs to shorten the length. Choose DIY decoration, choose your own style. And this strip light can be remote controlled to switch among 5 modes including color fixing, fading, flashing, strobe and flowing. 5 light modes including color fixing, fading, flashing, strobe and flowing. 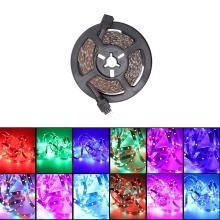 Consists of 300 SMD LEDs, its total length is 5m. Super flexible, soft FPC board and the adhesive tape on the back of the light make installation simple. Designed with the advantages of ultra bright light, mini volume, energy conservation etc. With 12V DC supply, it can be more safe and convenient. High efficiency and low energy consumption. Environmental friendly, low carbon, no radiation, no flicker, and no pollution to human and environment. Colorful lights, beautiful and gorgeous. Suitable for home, car, store, stage, bar, KTV, hotel, bridge etc.